In the early 2000s, the supply of adventure games had all but dried up after major studios like LucasArts and Sierra folded. But despite the shift in fans’ interest towards other genres, a few tenacious developers stood their ground and churned out some memorable point-and-click titles that are worth revisiting more than a decade later. Here are some of the seminal works from that dark age that you should check out. Just before this dark age hit, adventure games began shifting in favor of more three-dimensional environments. Grim Fandango was one of the first, as was The Longest Journey, which came out in 1998 and 1999, respectively. These games would inform the kinds of graphic adventures that managed to survive in the late 00s. In 2001, LucasArts released its final adventure game, Escape from Monkey Island. Sierra was no longer developing games by that point. In 2000, Erik Wolpaw wrote a piece on Old Man Murray titled “Who Killed Adventure Games?” The idea that “adventure games are dead” became an accepted notion among gamers, until they “rose again” roughly around 2007, when Telltale Games released their first Sam & Max titles. I recently came across a cache of old jewel cases while cleaning out a cabinet. I recognized the games as ones I’d played as a pre-teen, right in the middle of this so-called dark age, but the type of which I hadn’t exactly seen in the meantime. Most of these names were memorable only as flashes in the pan, blips on the cultural radar of the time period — Culpa Innata, Dark Fall, the Agatha Christie series. It’s not just that I hadn’t thought of them in the years since I’d played them. It’s that, outside a few niche websites, I’d never heard anyone talk about them. How could so many games have come out in this allegedly dead genre and yet have so few acknowledge them? So I played a few of them, to see what I could remember about them. And I found several that are still absolutely worth playing today. It’d be hard to talk about the adventure games of the post-LucasArts era and not mention Syberia. Often held up by genre fans as an example of the best parts of the point-and-click format, it’s the sort of game I expect most modern gamers to know from its much-delayed second sequel, Syberia 3. Full disclosure, I’ve never played that game, but I devoured Syberias 1 & 2, which I recommend playing back-to-back, as they tell a more complete story. Syberia stars Kate Walker, a lawyer on the hunt for the mysterious owner of a toy factory. Having discovered the man left on an adventure to discover the world’s last living mammoths on the titular island, Kate must pursue him on a clockwork train, stopping every now and then to tangle with colorful locals (think Metro Exodus if the hero were Nancy Drew). The game’s developer, Microids, also made the incomparable Still Life, a must-play if you’re at all a fan of this format and want to try your hand at an atmospheric crime drama. For those who find it compelling, both games feature interesting female protagonists. Elliot Grassiano, the founder and vice president of Microids, told TNW the market for adventure games at the time was largely composed of adult women. The year Syberia was released, the New York Times published a column about the state of adventure gaming. 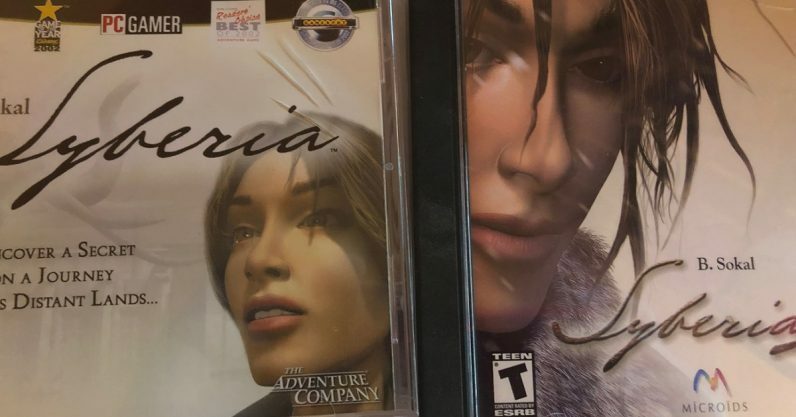 The writer derided Syberia as only good in comparison with its mediocre company, and called 2002, “the worst year for adventure games since the invention of the computer.” But having played the game again in recent years, I say it still holds up thanks to its charm and atmosphere. Microids managed to stay afloat through the mid 00s, but Grassiano said it was a “very hard time.” The company was purchased by Anuman Interactive in 2009, as was their back catalog, and still publishes adventure games under the old brand name. The last two notable releases were Agatha Christie: The ABC Murders in 2016 and the aforementioned Syberia 3 in 2017. Syberia, Syberia 2, and Still Life are all available on Steam. In 2002, Canadian video game publisher Dreamcatcher Interactive started a new publishing label specifically for adventure games. This label — appropriately titled “The Adventure Company” — would go on to release dozens of point-and-click adventure games between 2002 and 2008. In 2004 alone, it published 10 games — a full half of the adventure games released that year, if Wikipedia is to be believed. The Adventure Company (and Dreamcatcher, for that matter) published games of multiple types and genres, though most of them remained in the same point-and-click style — a spokesperson from THQ Nordic, which now owns Dreamcatcher, admitted the games were “not necessarily different.” I remember some real duds on that list, but there were a few with great charm and personality. If I could pick one game published by this company that I’m thrilled to play again, it’d be Keepsake. Released near the end of the dark age, Keepsake is set in a fantasy land in which the main character, Lydia, is starting her term at a magical academy. When she arrives, however, the school is completely deserted — meaning it’s up to Lydia and her talking wolf companion to figure out where everyone is. The game’s puzzles can be unbearably difficult, but if you’re willing to overlook that (and god knows I’m primed to overlook that by years of playing similar games), you’ll find a game with beautiful art design and scenery and an engaging story. The voice acting can be a bit on the corny side, but you will hear a pre-Uncharted Nolan North as the wolf. Dreamcatcher lasted an impressively long time, especially since lots of publishers of this particular genre went out of business during the dark age. Dreamcatcher’s parent company, JoWooD Entertainment, filed for bankruptcy in 2011, and was subsequently acquired by Nordic Games Holding. Keepsake is available on Steam. Curiously, this time period saw games dipping into their literary roots more than ever before. Games came out starring legendary detectives like Hercule Poirot, Nancy Drew, and — of course — Sherlock Holmes. Frogwares has made several Sherlock Holmes games, the first being 2002’s Mystery of the Mummy, one of the most obtuse puzzlers I’ve ever played. Its successor, Secret of the Silver Earring, is much more user-friendly and enjoyable (not to mention it adds Watson). Sherlock Holmes is called upon to solve a murder, displaying his characteristic sharp eye and wits in a twisting case involving a large inheritance, a corrupt company, and a mysterious woman who wears the titular earring. It’s a lovely game, in my opinion, better at being a mystery than most games like it. After Silver Earring, Amr said the company wanted to go in a new direction. Eschewing third-person, the company released a gloomy, atmospheric horror mystery best described as “Sherlock Holmes meets Lovecraftian horror” — because that’s literally what it is. If you’ve ever wanted to see Holmes confront something so completely outside his wheelhouse, this game is the one to play. Frogware’s latest Sherlock Holmes release was The Devil’s Daughter in 2016. The company is also set to release the horror-adventure game The Sinking City later this year. Both Silver Earring and The Awakened are now available on Steam. I would feel remiss if I didn’t recommend possibly the one game series that fully outlasted the entire adventure game dark age with its style intact — Her Interactive’s Nancy Drew series. A child of the Myst series, this first-person adventure series started with Secrets Can Kill in 1998. It was one of the many adventure games to be published by Dreamcatcher itself (not The Adventure Company), and managed to outlive that company. The last Nancy Drew game to be published by Dreamcatcher was the 15th, Creature of Kapu Cave. Her Interactive would go on to publish 20 more Nancy Drew games. While the market for adventure games has changed, we still have some pure, undiluted point-and-click games out there, and the Nancy Drew series hearkens to some of the best genre. If you want to play a great ND game specifically from that time period, I recommend Danger on Deception Island or Last Train to Blue Moon Canyon, both of which can be found on Steam. What adventure games do you remember from the early 00s? Reminisce with us in the comments.